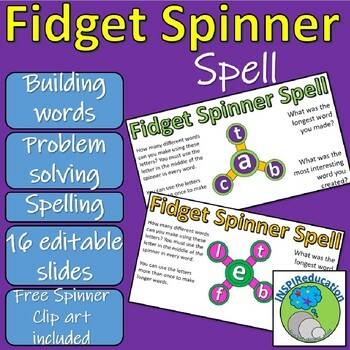 Using the theme of FIDGET SPINNERS, the aim of each slide is for children to make as many words as they can using the given letters on each arm of the Fidget Spinner. They must use the letter in the middle of the spinner in EVERY word! They can use the letters as many times as they want to make longer, more interesting words. If children think they have a plausible word, they should use a dictionary to check that the word is a real word, and also learn the definition of the word. This can then be fed back to the class at the end of the session when feedback is requested (see each slide in the preview for the key questions). What is the most interesting word the children were able to find? What is the longest word the children were able to make? 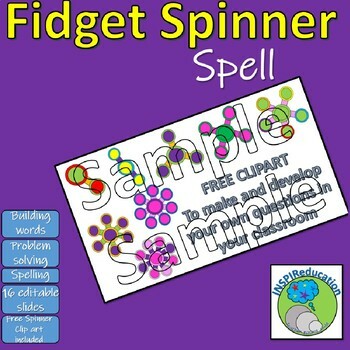 Clip art is included with this product so that teachers and children can make their own Fidget Spinner Spell Challenges for their friends. It can also be put in the Literacy Center to support learners further. Each slide is editable, so that, once the first 16 slides have been used, can be edited quickly and reused. We have found this resource incredibly successful. Children love the challenge, and after initially being happy with three and four letter words, are now stretching their learning to more complex, longer vocabulary. There is no time limit to these activities, so they can be short - or fill a specified time. 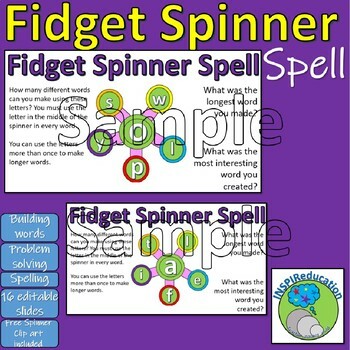 Also, there is no age limit to these activities as they will suit younger learners with early phonic skills, to older learners with a more detailed grasp of spelling rules and vocabulary. 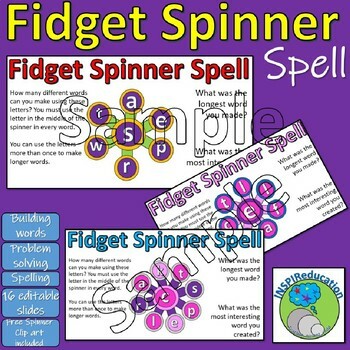 We hope that your children enjoy our FIDGET SPINNER SPELL INVESTIGATIONS.